Fruits are widely distributed in nature, commercially important and nutritionally indispensable food commodity. Being a part of a balanced diet, fruits play a vital role in human nutrition by supplying the necessary growth regulating factors essential for maintaining normal health. Whereas explode obesity, diabetes, cardiovascular and cancer diseases are in the majority of the areas in the World, the fruits represent a hope potentially very high to limit the harmful effects of them. Nevertheless, much of way remains to be made for better knowing the impact of the fruits and their components, on the health and the prevention of the principal chronic diseases. Beyond the consumable part of the fruits, an emphasis are also put on the by-products, such as the fruit peels, that could represent precious layers for food, medicinal or cosmetic purposes. The experiments reported that the "calcium carbide (CaC 2 )" treatment hastens the ripening processes of unripe fruits as shown by the rates of softening, respiration, flavor and color changes. Calcium carbide [Figure 1] is mostly used for ripening of fruit; while, its use is being discouraged worldwide, due to associated health hazards. Secondly, calcium carbide (CaC 2 ) is the commonly used chemical for ripening of fruits, due to its low price and availability in local market; however, use of this chemical in fruit industry is being discouraged worldwide due to dangers of explosion and carryover of toxic materials like arsenic and phosphorus to consumers, thus making the healthy fruit poisonous. Since no technical knowledge is considered necessary for its anomalous use,  higher quantity of calcium carbide needed to ripen immature fruit makes them tasteless. In view of the above problems, studies for an alternate ripening agent for fruit were imperative. Further, the local industry is also looking to replace calcium carbide with any suitable alternate. Calcium carbide absorbs moisture and produces acetylene, which is a weak analog of ethylene, responsible for triggering ripening process. , Today or in future we will be able find out some better alternatives for fruit ripening agents that have minimal or are without health hazards. 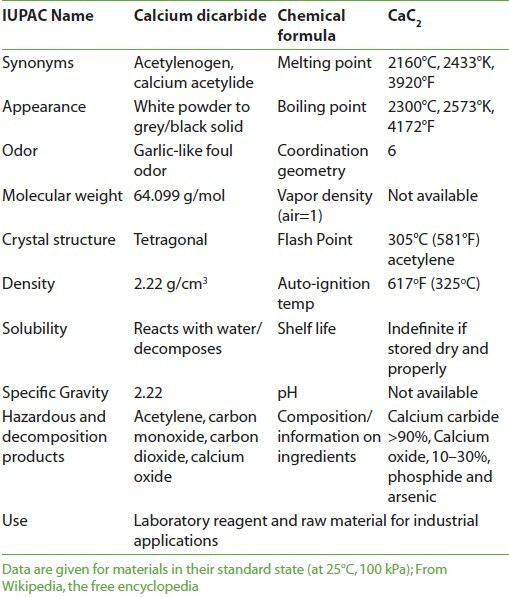 Physical and chemical properties of calcium carbide are shown in [Table 1]. Calcium carbide (CaC 2 ) is a chemical compound, pure material is colorless, but most samples have a color ranging from black to grayish-white. Its main use industrially is in the production of acetylene and calcium cyanamide. Calcium carbide is produced industrially in an electric arc furnace from a mixture of lime and coke at approximately 2000°C and produced generally around 80% calcium carbide by weight. Calcium carbide (CaC 2 ) is used to make acetylene gas (for use in acetylene torches for welding) and in the manufacturing of plastics (polyvinyl chloride). The reaction of calcium carbide with water was discovered by Friedrich Wohler in 1862. This reaction is the basis of the industrial manufacture of acetylene as major industrial use of calcium carbide. Calcium carbide reacts with nitrogen at high temperature to form calcium cyanamide and it is used as fertilizer. It is hydrolyzed to cyanamide, H 2 NCN. Calcium carbide may cause severe eye irritation with possible burns. Eye contact may result in permanent eye damage or blindness. It may cause stinging pain, severe burns, watering of eyes, inflammation of eyelids and conjunctivitis, opacity and scarring. Immediately flush eyes with plenty of water for at least 15 minutes, occasionally lifting the upper and lower eyelids. Remove contact lenses if worn. Get medical aid immediately. Wear appropriate protective eyeglasses or chemical safety goggles or face protection regulations. Calcium carbide may cause severe skin irritation, rash, burning feeling, redness, with possible burns. Its contact with skin causes irritation and possible burns, especially if the skin is wet or moist. When in contact with moist skin, caustic lime is formed, which can lead to ulceration and scarring. Repeated/prolonged skin contact may cause dryness or rashes. Immediately flush skin with plenty of soap and water for at least 15 minutes while removing contaminated clothing, shoes and wash contaminated skin with large amounts of water. Wear appropriate gloves to prevent skin exposure. Get medical aid immediately. It causes digestive, respiratory and gastrointestinal tract burns, nausea, vomiting, bloating and headache. Rinse mouth with cold water. If victim is conscious and alert, give 2-4 cupfuls of milk or water. Never give anything by mouth to an unconscious person. Give victim 1-2 tbsp of activated charcoal mixed with 8 oz water. If problem is serious, get medical aid immediately and call Poison Control immediately. Mouth, nose, throat and lung irritation with coughing and severe shortness of breath (pulmonary edema), rapid irregular breathing, headache and burns to mucous membranes. May cause severe irritation of the upper respiratory tract with pain, burns, inflammation and can produce delayed pulmonary edema. Repeated inhalation may cause chronic bronchitis. Remove from exposure to fresh air immediately. If not breathing, give artificial respiration. If breathing is difficult, give oxygen. Remove the person from exposure. Get medical aid immediately. Wear appropriate protective clothing to prevent contact with skin and eyes. Wear a self-contained breathing apparatus (SCBA) to prevent contact with thermal decomposition products. Wear chemical splash goggles and chemical resistant clothing such as aprons and gloves (nitrile and natural rubber). Wash hands thoroughly after handling material and before eating or drinking. Use respirator with a dust cartridge. Contact with moisture or water may generate sufficient heat to ignite nearby combustible materials by formation of flammable acetylene gas. Contact with acid or acid fumes evolves heat and flammable vapors. Begin artificial respiration if breathing has stopped and CPR if necessary. Incompatible materials, contact with water, acids, exposure to moist air or water, oxidizers. Contact with water liberates highly flammable gases. Contact with water produces heat and flammable acetylene gas and possibly fire. Fire risk when added to water. Flammable solid, when heated to decomposition, emits acrid fumes. Contact with water produces flammable acetylene gas which will ignite. Poisonous gases are produced in fire, including calcium oxides. Do not use carbon dioxide, foam, water and halogenated agents. Use approved class D extinguishing agents or smother with dry sand, dry clay or dry ground limestone dry sodium chloride or dry graphite, sodium bicarbonate and dry chemical. Cover with dry lime, sand or soda ash and place into sealed containers for disposal. Use only non-sparking tools and equipment, especially when opening and closing of containers. Use with adequate ventilation and do not breathe dust or vapor. Avoid contact with skin, eyes, or clothing. Minimize dust generation and accumulation. Do not ingest or inhale. Wash hands thoroughly after handling. Store in tightly closed metal containers, in a cool, dry, well ventilated, locked store room away from incompatible materials. Keep away from water, sources of ignition and oxidizing materials. Avoid generating dusty conditions. Use a spark-proof tool especially when opening and closing containers. Store in flammable area with other flammable materials. Stable under normal conditions of use like, normal temperatures and pressures. Reacts vigorously with water to form highly flammable acetylene gas, which may ignite spontaneously. Lime may also be formed raising the pH of the solution and causing a white precipitate. Material has not been found to be a carcinogen nor produce genetic, reproductive, or developmental effects. Calcium carbide reacts with water and moisture to produce flammable acetylene gas and lime. The heat of the reaction may ignite the acetylene. It reacts with copper, silver, mercury and brass to form explosive compounds such as metal acetylide. Calcium carbide is not compatible with methanol; oxidizing agents (such as per chlorates, peroxides, permanganates, chlorates, nitrates, chlorine, bromine and fluorine); strong acids (such as hydrochloric, sulfuric and nitric); acid fumes; strong bases (such as sodium hydroxide and potassium hydroxide); and metal salts and metal oxides (such as iron chloride and iron oxide). Incompatible with water or moisture, unalloyed copper, silver and mercury, lead fluoride, magnesium, selenium, silver nitrate, sulfur, silver nitrate, sodium peroxide, stannous chloride and chlorine. Arsenic is a naturally occurring element widely distributed in the earth's crust. It combines with oxygen and other elements to form inorganic arsenic compounds. It is used in the formulation of pesticides and fungicides and also manufacturing of glass. Inorganic arsenic compounds also can be used in pressure-treated wood. Inorganic arsenic compounds can dissolve in water, get into food, or blow on the wind in arsenic-containing soil. Arsenic can get into plants when their roots take up water that contains arsenic. It can get into animals when they eat food, drink water, or breathe air that contains arsenic. In plants and animals, arsenic combines with carbon and hydrogen to form organic arsenic compounds. Organic arsenic compounds are less toxic than inorganic arsenic compounds. Arsenic can build up in fish and shellfish, but the arsenic in fish is mostly the organic form and therefore much less harmful. People exposed to high levels of arsenic can have nausea and vomiting, diarrhea, anemia, and low blood pressure. These symptoms may be followed by a feeling of "pins and needles" in the hands and feet (neuropathy). Chronic (long-term) exposure to arsenic can cause stomach ailments, headaches, fatigue, neuropathy, dark splotches on the skin, and small "corns" or "warts" on the palms of the hands, soles of the feet, and torso. People exposed to inorganic arsenic can have more cancer of the lung, skin, bladder, liver, kidney, and prostate. Studies have not linked arsenic exposure to leukemia in adults or children. Normal urine levels of arsenic are less than 50 μg/L. A level between 50 and 200 μg/L not necessarily represent a health risk. A level over 200 μg/L is considered abnormal and may require treatment if symptoms of arsenic poisoning are present. Physical findings in arsenic toxicity vary with age and dose. Any combination of GI complaints, neurologic dysfunction, and anemia should prompt a search for arsenic toxicity. GI complaints predominate in adults. Children are more prone to CNS dysfunction, including encephalopathy. Encephalopathy is rare in adults. Encephalopathy may present as an acute event with seizures, or it may develop slowly over weeks to months with variable nonspecific complaints. Cholera like diarrhea can be seen in acute arsenic toxicity. Neurologic complaints ranging from neuropathy to encephalopathy have been reported in cases of acute arsenic toxicity. Arsenic toxicity presenting as ascending flaccid paralysis is often. The key to treating arsenic toxicity is removal of the offending agent and reducing the total body load of arsenic. Chelation agents are used to reduce the body stores of arsenic. Chelation therapy with Dimercaprol (British Anti-Lewisite; BAL)-DOC, DMSA, or d-penicillamine and edetate calcium disodium is the primary treatment of arsenic or other metal toxicity. Removal of the offending agent and aggressive gastric decontamination aids in reducing ongoing absorption of arsenic. Hemodialysis may be beneficial in patients with acute renal failure. The fast ripening of fruits means they may contain various harmful properties. A commonly used agent in the ripening process is calcium carbide, a material most commonly used for welding purposes. Calcium carbide treatment of food is extremely hazardous because it contains traces of heavy metal arsenic and phosphorous. The calcium carbide produces acetylene gas when react with water. Acetylene gas may affect the neurological system by inducing prolonged hypoxia. Calcium carbide causes various health hazards like, headache, dizziness, mood disturbances, sleepiness, mental confusion, memory loss, cerebral edema and seizures. These results indicate that fruit treatment with calcium salts not only affects the ripening process but also influences the aroma of the fruits. The commonly used ripening agents other than calcium carbide are acetylene, ethylene, propylene, ethrel (2-chloroethyl phosphonic acid), glycol, ethanol and some other agents. , The calcium carbide is one of the most commonly used ripening agent for fruits while other calcium salts like calcium ammonium nitrate, calcium chloride and calcium sulphate are used to delay fruit ripening agents for local fruit industries. 1. Hartshorn, Robert H. The effect of acetylene, ethylene and prophylene on horticultural material. Cornell University Thesis. Washington, DC: 1929. p. 1-38. 2. Anjum MA, Ali H. Effect of various calcium salts on ripening of mango fruits. J Res Sci 2004;15: 5-52. 3. Ruchitha G. Effects of diluted ethylene glycol as a fruit-ripening agent. Global J Biotechnol Biochem 2008;3:8-13. 4. Dudley R. Ethanol, fruit ripening, and the Historical origins of human alcoholism in primate Frugivory. Integr Comp Biol 2004;44:315-23. 5. Steve S. Ripening tomatoes with ethylene. Institute of Food and Agricultural Sciences, University of Florida. Date Reviewed: March 2000. 6. Cua AU, Lizada MC. Ethylene production in the 'Carabao' mango (Mangifera indica L.) fruit during maturation and ripening. Acta Hort 1990;269:169-79. 7. Padmini S, Prabha TN. Biochemical changes during acetylene-induced ripening in mangoes (var. Alphonso). Tropical Agric 1997;74:265-71. 8. Singh Z, Janes J. Effect of postharvest application of ethephon on fruit ripening, quality and shelf life of mango under modified atmosphere packaging. Acta Hort 2001;553:599-601. 10. Anwar R, Malik AU, Amin M, Jabbar A, Saleem BA. Packaging material and ripening methods affect mango fruit quality. Int J Agric Biol 2008;???:1814-9596. 11. Suhardi Y. Ripening retardation of Arumanis mango, ASEAN Food J 1992;7:207-8. 12. Nagarag P, Ramance KV, Prasad BA, Malibar S, Ananthabrishna SM. Effect of calcium carbide on ripening and quality of 'Alphanso' mangoes. J Food Sci Technol 1984;21:278-82. 13. Paj RK. Influence of etherl and calcium carbide on respiration rate, ethylene evolution, electrolyte leakage and firmness of 'Dashehari' mango (Mangifera indica L.). Indian J Agric Sci 1968;68:201-3. 14. Singh RP, Tandon DK, Kalra SK. Change in post-harvest quality of mangoes affected by pre-harvest application of calcium salts. Sci Hort 1993;54:211-9. 15. Mariappan P. How do raw mangoes and bananas become ripe when treated with chemicals (Answer-2)? In: The Hindu-Online edition of India's National Newspaper. Dated: 29th July, 2004. 16. Subramanian S. How do raw mangoes and bananas become ripe when treated with chemicals (Answer-1)? In: The Hindu-Online Edition of India's National Newspaper. Dated: 29th July, 2004. 17. Lewis, R. J. (1996). Sax's Dangerous Properties of Industrial Materials (9 ed.). New York, NY: Van Nostrand Reinhold. p. 635. ISBN 0471378585. 18. Patnaik P. Handbook of Inorganic Chemical Compounds. McGraw-Hill; 2003. ISBN 0070494398. Retrieved 2009-06-06. 19. Morehead JT, de Chalmot G. The manufacture of calcium carbide. J Am Chem Soc 1896;18:311-31. 20. Greenwood, Norman N, Earnshaw A. Chemistry of the elements. 2nd ed. Oxford: Butterworth-Heinemann; 1997. 21. Government takes measures to curb development of calcium carbide sector. Available from: http://www.busytrade.com. [cited in 2007]. 22. Jamie L, Stefan S, Goro Toki. Calcium Carbide. SRI Consulting. 2004. 23. Clemmer G. American Miners' carbide lamps: A collectors guide to American carbide mine lighting. Westernlore Publications; 1987. 24. Abeles FB, Gahagan HE 3rd. Abscission: The role of ethylene, ethylene analogues, carbon dioxide, and oxygen. Plant Physiol 1968;8:1255-8. 25. Calcium Carbide Manufacturing 2008 Material Safety Data Sheet. 26. Pawan S. Artificial ripening of fruits punishable . 2010. p. 56. 27. Ball H. Arsenic poisoning and Napoleon's death. New Sci 1982;101-4. 28. Goldfrank LR, Flomenbaum NE, Lewin NA, Howland MA, Hoffman RS, Nelson LS. Goldfrank's Toxicologic Emergencies. 7th ed. McGraw Hill; 2002. p. 812-57. 29. Kaye P, Young H, O'Sullivan I. Metal fume fever: A case report and review of the literature. Emerg Med J 2002;19:268-71. 30. Golub RG, Choudhury H, Hughes M, Kenyon E, Stifelman M. Sue paper on the human health effects of metals. August 19, 2004. 31. Stejskal V, Hudecek R, Stejskal J, Sterzl I. Diagnosis and treatment of metal-induced side-effects. Neuro Endocrinol Lett 2006;27 Suppl 1:1-16. 32. Brixen K, Nielsen HK, Charles P, Mosekilde L. Effect of a short course of oral phosphate treatment on serum parathyroid hormone (I-84) and biochemical markers of bone turnover: A doseresponse study. 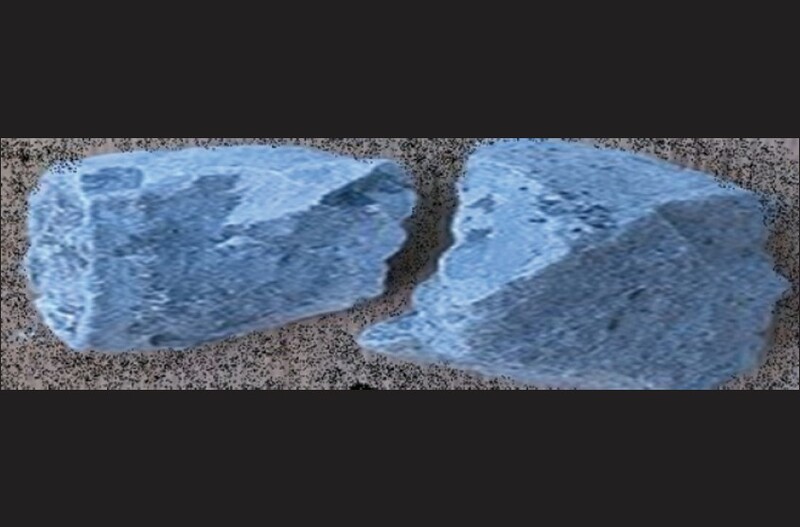 Calcified Tissue Int 1992;51:276-81. 33. Goldsmith RS, Bartos H, Hulley SB, Ingbar SH, Moloney WC. Phosphate supplementation as an adjunct in the therapy of multiple myeloma. Arch Intern Med 1968;122:128-33. 34. Goldsmith, Jowsey RS, Dube J, Riggs WJ, Arnaud BL, Kelly CD. Effects of phosphorus supplementation on serum parathyroid hormone and bone morphology in osteoporosis. J Clin Endocrinol Metab 1976;43:523-32. 35. Freire JM, Chitarra AB. Effect of calcium chloride application on hydrothermally treated mango cv. Tommy Atkins fruits. Pesquisa Agro Brasil 1999;34:761-9. 36. Per H, Kurtoglu S, Yagmur F, Gumus H, Kumandas S, Poyrazoglu MH. Calcium carbide poisoning via food in childhood, J Emerg Med 2007;32:179-80.